It's certainly not going to be an easy path to a second consecutive state championship for the Lexington boys. They've lost three of their top five from last season to graduation and therefore lack the depth that their girls program currently holds. "Just Kyle and Noah are remaining [from last year's top five], so I knew we were going to need the whole season just to even come around to having a solid team," head coach Denise Benson said. But it'd be foolish to count out a team led by Kyle Johnston. The senior was fourth overall in DII at the state meet last season and has collected several noteworthy wins this season, including at the OHSAA Early Season Invite, the Granville Invitational, the Tiffin Cross Country Carnival, the Malone University Invitational and more. In his most recent effort, Kyle Johnston took second at the prestigious Portage Invite. While those wins are nice individual accolades, Johnston says the biggest value of the victories come in the form of motivation not only for him, but the rest of his team. "Wins like that hopefully help the team along and gives them more confidence as well, because that's why I'm doing this, that's why I'm running," Johnston said. "We want to do as best as we can as a team and not so much as an individual. So it's good to get those wins for the team." The program has also found motivation in Johnston's fellow senior Noah Sgambellone. 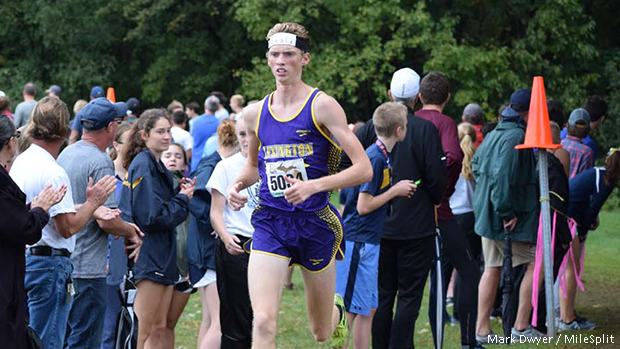 He was the team's fourth finisher in 66th place at the state meet in 2017 and has turned himself into one of Ohio's most competitive runners in 2018 despite nearly having to forego the season - and perhaps the rest of his career - due to a back injury that required surgery for a second time. "This was a big thing because we did not expect him this spring to have to sit out of track and have a second surgery," Benson said. "So that was a setback with him. And like Kyle had said, that truly has motivated all the boys and the girls to be like, wow, Noah wants this so bad.'" Behind Sgambellone a pack has slowly begun to solidify, according to Benson. Senior Clay Sturts and sophomore Chayse Whitesel - Lexington's sixth and seventh runners at the State Championship last season, respectively - along with senior Chris Stevens have stepped into the 3-4-5 positions, which Benson said the team's success in the post season will depend on. "We're counting on them, they're working together and those are going to be our deal breakers come postseason - it's going to be what those three can put together." No matter what, when all is said and done on November 3rd, Lexington will have made plenty of headlines with Johnston in the mix for the individual title. Whether or not a second straight team title - what would be their third in four years - is among those headlines is less of a certainty. "We're making some progress," Benson said, but I'm very thankful that we have a few more weeks here to put in some work."